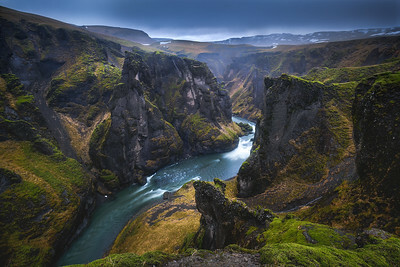 A beautiful small canyon carved by glacial water in Iceland. Although we got a fleeting glimpse of clearing clouds further down the canyon, the weather quickly closed in and had starting raining by the time we reached this spot. The soft glow of a distant glacier can be seen over the horizon. When we walked around the corner and up to the edge Laura immediately told me that she wanted a print of this view for our house. Two exposures, tripod using Fuji X-E2s with Fujinon XF 10-24 f/4 R OIS lens. 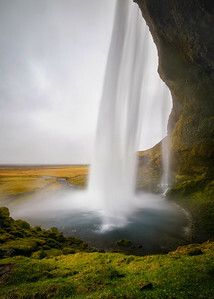 This is the most famous waterfall in Iceland. Photos don't do justice to the size and power of this waterfall and it's pretty exciting to be able to walk completely behind it. The spray is so extreme, it is like being in a heavy and constant rain. Taking pictures in this environment is extremely difficult and I felt lucky to find my composition quickly and I was able to fire off a couple of frames and get back to a dry spot. Two exposures, tripod using Fuji X-E2s with Fujinon XF 10-24 f/4 R OIS lens, 6 stop ND filter. 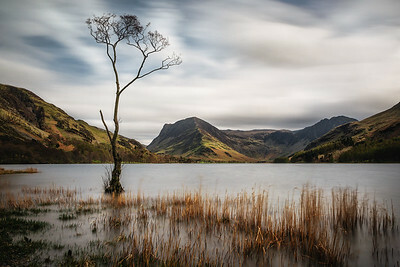 Lake Buttermere in the Lake District National Park, Cumbria, UK. Laura and I enjoyed the scenery as we walked the relatively easy but beautiful 4.5 mile trail around the lake. The north end of the lake is lined with some large and graceful oak trees, however Laura was quite ammused to learn that this small and scraggly tree is what I was interested in photographing. I was determined to get a workable photo even with with constant 20 mph winds and 40 mph gusts, it was just a matter of waiting long enough to get the right light on the shore grasses. Luckily Laura found a nice pub and glass of wine in the pub nearby while she waited on me. Single 60s exposure, tripod using Fuji X-E2s with Fujinon XF-R 16-55 f2.8 WR lens, 10 stop + 3 stop ND filters. Blencathra in the Lake District National Park, Cumbria, UK. On this morning I hiked to the summit of Blencathra alone in the dark and reached it in time for sunrise. I had underestimated the steepness of the last pitch and in order to maintain my schedule of reaching the summit of under two hours I had to keep pushing. Unfortunately I had to stop briefly to evacuate my dinner (and beers) from the night before. 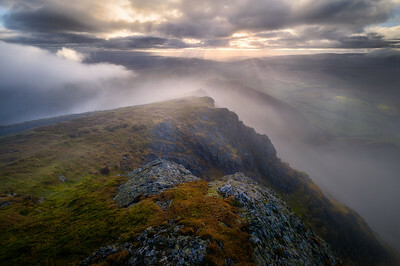 But I was able to enjoy my time quietly sitting and watching the fog roll over Sharp Edge from above for almost an hour before I decided the light was not going to cooperate on the iconic view so I started my trek back down. I chose Scales Fell ridge as my route for the decent due to the beautiful grassy ridge line and expansive views to the east. 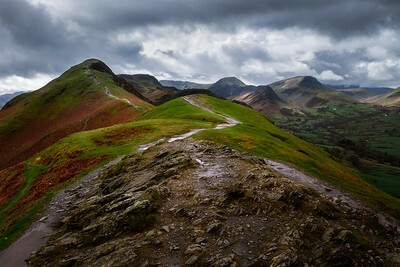 The hike down and the quickly changing weather was one of the highlights of my Lake District trip. I snapped this photo hand-held just as a passing cloud enveloped the ridge. In the distance the small peak of Great Mell Fell can be seen, and just between the far ridges in the distance is the lake of Ullswater. Multiple exposures shot handheld and manually blended; with Fuji X-E2s and Fujinon XF 10-24 f/4 R OIS lens. Cat Bells trail view looking southwest. A lone hiker, or "walker" as they are called in the UK can be seen at the top of the summit of Cat Bells in the Lake District National Park, Cumbria, UK. Just a short ferry ride to the Hawes End landing from Keswick and a quick hike to the lower summit reveals that your hike isn't quite done yet. Off in the distance the peaks of Dales Head fell and Robinson fell can be seen. In the valley below is Little Town. By the time we reached the summit, we were treated to a typical English shower. The hike down from the summit to the east and a nice walk along the shore of Derwentwater took us back to Hawes Landing to catch the ferry back to Keswick. Single exposure, hand held using Fuji X-E2s & Fujinon XF-R 16-55 f2.8 WR lens. 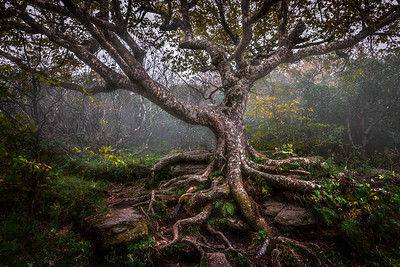 A gnarled birch tree on a foggy fall afternoon, a well known landmark on the Craggy Garden trail off the Blue Ridge parkway. 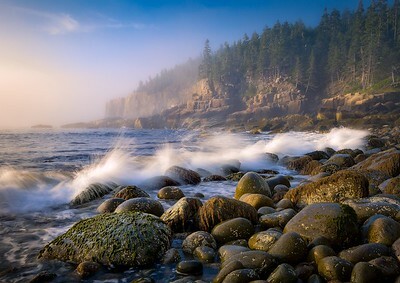 Otter Point in Acadia National Park, Maine, USA. I sat for quite a while waiting for the morning fog to clear. In that time I had to keep working down the rocks as the tide was going out very quickly. 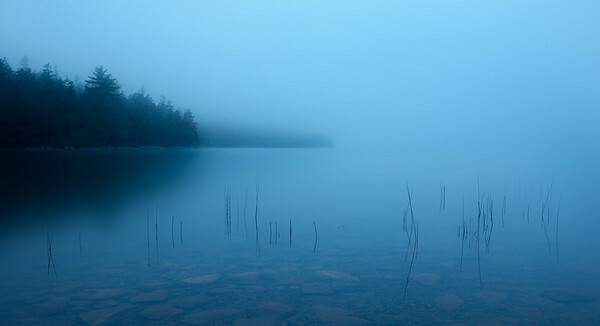 A foggy evening at Jordan Pond in the Acadia National Park, Maine, USA. We ate dinner at the pond house after the horse carriage ride to the summit of Day mountain. Unfortunately the summit was socked in with fog. After that we came down to the pond house and had a nice dinner outside on the lawn watching the fog. I Shot this one week before the "peak" of the Perseids this year, and was amazed to get so many nice meteors in a short amount of time. Was fortunate enough to get my family out to the rocks this year to witness the wonderful show. I shot the sky before moonrise, the foreground after moonrise. 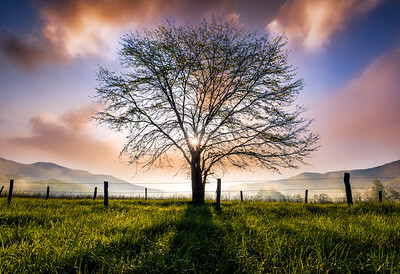 It was a 4 shot vertical pano. 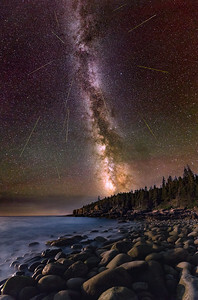 8 additional frames for the meteors. 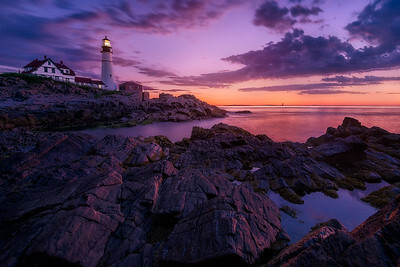 Portland Head Light in Maine; a nice light breeze, there was only silence except for the fog horn and a few gulls. 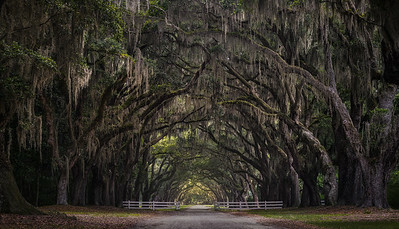 Wormsloe Plantation, located in Savanna, Georgia and it's 400 live oak trees. It's hard to convey the size and beauty of the live oak. To me there is nothing better than a walk under their quiet canopy on a breezy day. 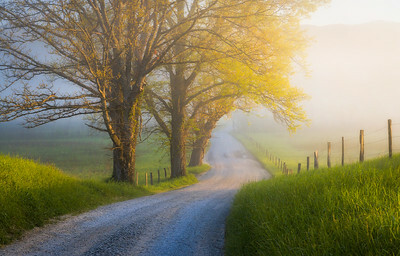 Foggy scene in Cades cove in the Smoky Mountains National Park. 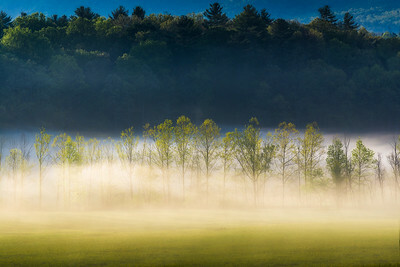 I was struck by the way the low hanging fog surrounded these budding trees that were bathed in warm morning light, contrasted against the hillside that was still in shadow. 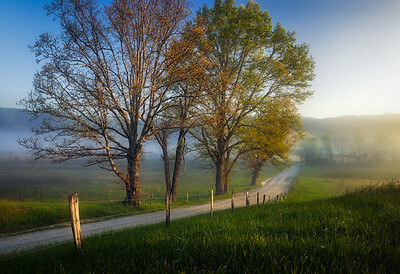 Every morning in Cade's Cove is a beautiful event... it definitely was when I visited there with some photography buddies this spring. 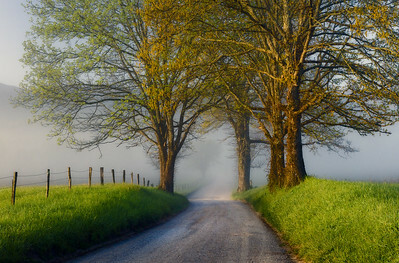 Springtime on Hyatt Lane in Cades Cove in the Great Smoky Mountain National Park. 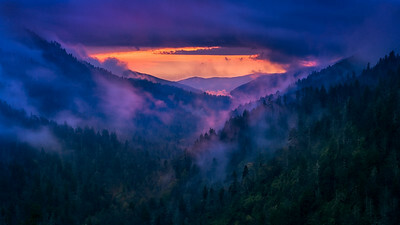 It was a special moment after waiting on the sun to rise over the far ridge line and to see it bathe the foggy valley in beautiful warm light. 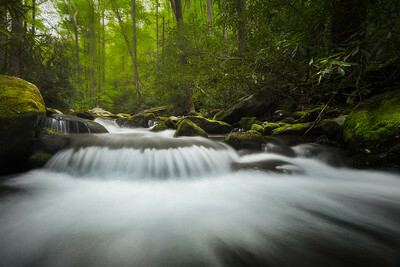 Just upstream from from the Tremont facility at the Great Smoky Mountain National Park. 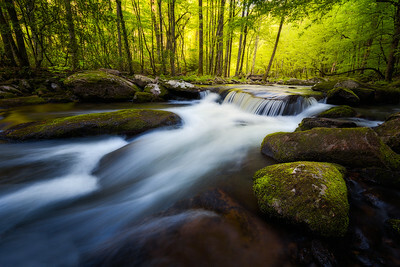 Getting up early for sunrise every morning in Cades Cove meant we had to shoot the streams in the middle of the afternoon after a nice nap ;-). 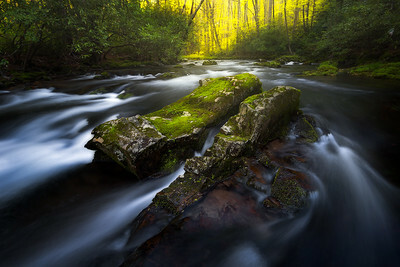 Spring in the Great Smoky Mountains National Park. We saw this split rock in the river and knew we had to photograph it. It was a good to have photography buddies there as it would be too treacherous to try to cross the river solo. 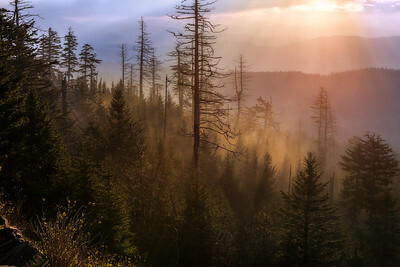 A foggy sunrise at Clingman's Dome in the Smoky Mountain National Park. Roaring fork motor nature trail in the GSMNP near Gatlinburg, TN. A partly cloudy day, just waiting for the sun to go behind some clouds. I took a moment to rest at this spot in the water and take a few test exposures before it was dark enough. Morton's Overlook in the Great Smoky Mountain National Park. First time seeing fog like this, it was crazy. We came over the mountain through the rain and dense fog to find a hole punched in the sky about 15 minutes after sunset. A very early spring at this high elevation, thankfully the valley where the falls sit had the green vegetation that I was looking for. Soco Falls is on the way to the Great Smoky Mountain National Park between Cherokee, NC and Maggie Valley, NC and a short distance from the Blue Ridge Parkway. A good rainfall produced a nice amount of flow in the creeks.